PALMERSTON – Chanting “Education is a right; We will not give up the fight,” students from Norwell District Secondary School walked out of class on April 4 to protest the Ontario government’s planned education changes. The action was part of a protest by students at 600 Ontario schools in opposition to the province’s plans, including larger class sizes and mandatory online courses. The province-wide protest involved elementary and high school students and was organized by students on social media under the hashtag #StudentsSayNo. At Norwell the protest was organized by student council members. “We’re walking out because we’re not okay with the changes that Doug Ford is making to our education,” said student council president Lindsay Lacroix. “We disagree with the mandatory e-learning courses. They don’t work for everyone and the e-learning courses that we have now, I find, are not very user friendly and you want us to take four, so that would not be very effective and it’s not everyone’s learning style.” Lacroix said students are also concerned about the impact of cutbacks and increased class sizes “that we believe will directly affect the arts program specifically. Total taxes to rise by $84 on average Minto residence MINTO – The average residential taxpayer here will pay an additional $84 in 2019. Minto council passed the town’s 2019 budget with an overall tax increase of 2.8% for an average residential property assessed at $233,000. The estimated $84 increase in local taxes includes Wellington County and provincial education taxes and assumes there will be no changes to tax policies set by the county, and that education tax rates follow past trends, the town states in a press release issued following council’s approval of the budget on April 2. PAINT and COLLISION Specializing in... Collision and Complete Re-Finishing, One Mile East of Moorefield. Drayton and District Figure Skating Club's AGM and Awards Night at the PMD arena hall, 7pm. Skating families will receive awards, badges, carnival photos and earned fundraising refunds. Bring peanut-free snack to celebrate the end of our skating season! Moorefield Optimist Dinner & Hypnotist Show with Richard Cole at Moorefield Community Centre, Cocktails 6:30pm, Dinner 7:30pm. Tickets: $40 from a Moorefield Optimist Member. Info: Jeremy 519-616-2095. Proceeds to EmpoWErment Day. Fish Fry at Knox-Calvin Presbyterian Church, 135 Elora St S, Harriston. Sittings: 5 & 7pm. Tickets: Adults - $15, Kids 10 & under - $10 and preschoolers free. Call 519-338-2624 for tickets. Farmers’ Pre-Seeding BBQ at the Palmerston Community Centre. Enjoy a steak dinner, followed by a live auction with great donated items. Event helps the Ag Society do more within the community. Tickets: $30 incl. dinner. Call Tony 519-343-2905. Alma Optimist Country Dance at 8pm. Alma Community Centre - Dance to Bill Beattie. Community Christian School's Spring Bazaar and Auction, PMD Arena, 9:30am-3pm, Entry: Food Bank donation/free will offering to school. Silent auctions, crafts, games, baking & food booth. Pulled Pork Supper: 5-7pm, eat in/take out. Live Auction: 7-11pm. Entry: Food Bank donation/freewill offering to school. Ladies Lenten Tea, 1:30pm, Drayton Reformed Church. Come enjoy a cup of tea, some food and a time together. Guest Speaker: Betsy DeVries. ATV Safety Info Night, 7:30pm, Palmerston Fire Hall. Learn about local regulations. Refreshment will follow. All welcome. Wellington Christian Farmers Assoc. 2019 Annual Spring Banquet & AGM. Alma Community Centre, 51 Simpson St. Alma. Social 7pm, Dinner 7:30pm. $15/plate. Speaker: Beauty for Ashes Transformation House. RSVP to board member by Apr 16. Euchre is Cancelled at the Drayton Legion due to it being Good Friday. See you at the next one! Community Easter Egg Hunt presented by the Mapleton Preschool. Kinsmen Park, 10:30am. Bring a Basket. Donations to Mapleton Preschool greatly appreciated. More Info: Betty 519-638-3299. Jamming at the Drayton Legion. 2pm. Join us for an afternoon of free entertainment. Kinettes planning ‘Sip and Social’ Wellington hired Mike Farwell as part of his annual Farwell4Hire campaign. Farwell will serve appetizers and interact with guests while raising money for Cystic Fibrosis Canada, the national partner for Kin Canada, including the Kinette Club of Drayton. Cystic fibrosis is the most common fatal genetic disease affecting children and young adults. When Kin Canada started a partnership with Cystic Fibrosis Canada, the average life expectancy of someone with the disease was under 10 years. Now, thanks in part to the support of Kin clubs, life expectancy is well into patients’ 50s. “We hope you come out to enjoy yourself, but also know that by attending you are supporting an incredibly worthwhile cause,” officials state. Sip inaugural The and Social is May 3 at the Maryborough Community Centre, 15 Ball Avenue, Moorefield, at 7:30pm. Tickets are $25 and available from club members, at Dobben’s Hardware in Drayton or by emailing draytonkinettes@gmail.com. Officials note that due to the anticipated popularity of the event, advance ticket purchase is encouraged. The event is limited to those aged 19 and older. festivals, events listed in guide WELLINGTON COUNTY - The 2019 Wellington County Festivals and Events Guide is now available. 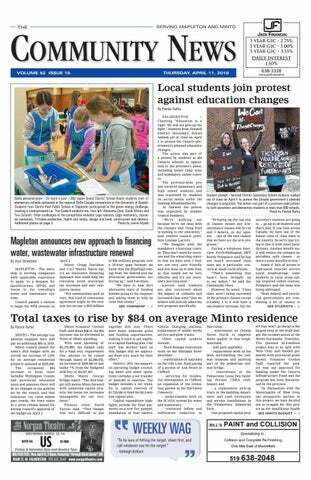 Copies were distributed in the April 4 Wellington Advertiser and are also available at local municipal offices and library branches. The guide can also be viewed online and residents and visitors can visit the online festivals and events calendar to learn more about events happening in the county. to take time off classes to do these types of things.” He added, “Protests that we’ve had in the past - we’ve had a different protest by teachers - they at least stay and do their work and they do their protests after school. So I think that’s something the students need to think about, whether it was worth their while missing classes to do this type of thing. So that’s my concern.” Pettapiece said the proposed changes are about improving education, as well as financial efficiency. “We’ve got over 100,000 less students than we had a few years ago, and yet we’ve got thousands more teachers. So we’re just trying to make the system as effective as we can,” he aid. “We need to get back to basics, get back into the sciences - financial literacy is very important … this is our focus, to make sure students have the best education that they can, if they choose to move on to university, or to college or into the trades.” Norwell principal Paul Richards told the Community News his only role in the event was to ensure student safety. He said he urged students to stay away from the roadway and arranged for the school’s designated OPP officer to park a cruiser with lights flashing near the protest site in order to alert drivers to the students’ presence. “My job is just to make sure your kids get home safe,” Richards said. impact the budget. Duff said it won’t be factored in at this time. “Basically that’s not in this budget. We received it on Friday and parked it,” Duff explained. “For the purposes of this budget, it’s found money, it’s not there.” Duff said staff will look for ways to achieve efficiencies. Though he noted the funding announcement didn’t contain strict guidelines or reporting requirements, he said using it for a single project would not likely be encouraged. “There’s no great rush to do it so we’re going to take our time,” said Duff. Mayor George Bridge said although there’s “no strings attached,” with the money, Association of Municipalities of Ontario officials he’s talked to are “getting a feeling from the government they want to see success stories.” Minto’s budget contains no new borrowing in 2019 and total external debt will fall from $8,688,000 to $7,518,000. “Indications are there will be fewer infrastructure grants available in the next few years, so future capital spending will be difficult to sustain at $5 million annually,” the town states in the press release. “The town will continue to push for sustainable funding and a comprehensive infrastructure program from the federal and provincial governments.” In the release, the town notes Minto is committed to full cost recovery for water and wastewater systems, which are entirely user pay. Funding for water and sewer projects, including debtservicing, is paid by user charges. An external accreditation will take place in the fall under the new and stricter Drinking Water Quality Regulations, the release states. The town also noted the Tax Relief Program for Low Income Seniors and Persons with Disabilities administered by the County of Wellington continues for 2019. Applications by qualifying individuals may be sent to the municipal office after the final property tax bills are issued in early September. Applications are due by Nov. 1. Current forms and more information can be obtained by contacting the Minto municipal office. Celebrate our 100th anniversary with a FREE phone on us*! Good Friday Holiday changes for Garbage and Recycling. All County of Wellington waste facilities will be CLOSED on Friday, April 19. Friday curbside collection will be rescheduled to Saturday, April 20. See store for details. Oﬀer ends April 30, 2019. *Minimum $85/mth plan, 2 yr term required for Samsung S10e. Minimum $110/mth plan, 2 yr term required for Samsung S10. Available to new and existing customers who meet upgrade requirements. Cannot be combined with any other promotion. Who voted for this? Lately, it seems, the premier nobody wanted spends a lot of time solving problems that exist, if at all, pretty far off most people’s radar. To recap: Doug Ford won the Progressive Conservative leadership in a hastily organized contest due to a convoluted electoral formula. Despite losing both the popular vote and riding by riding count, Ford narrowly prevailed over chief rival Christine Elliott by virtue of an electoral points system weighted on the number of ballots cast in a given riding. On general election night, a Ford-led PC party captured only 40 per cent of the popular vote, but that was good enough to win in 60 per cent of the ridings. Now, despite the fact 60 per cent of Ontarians voted for more left-leaning parties, Ford touts his majority and is able to govern as if all were willing conscripts to Ford Nation. So Ontarians watch as Ford follows a template made infamous by the last Ontario Conservative government, including reckless deregulation and cuts to health, education and social systems. Perhaps it’s because most of the solutions Ford and his minions (which is what he’s reduced his cheering-section MPPs to) put forward to real issues in important areas are so poorly thought out they blow up in their faces, that they also seem compelled to simultaneously promote a series of meaningless, and generally liquor-related, distractions. “Buck a Beer,” booze in corner stores and longer liquor hours have all been promised, if not always delivered by Ford and company. This week, just prior to the release of his government’s first budget, Ontarians are being promised U.S.-style tailgating parties, sure to be a hit with police force across Ontario who have spent decades combatting the concept of “trunk bars” at gathering places across the province. Was this an election issue? Did I miss it? Also this week, Ford Nation is floating the elimination of front license plates as a means to shave a few pennies off the cost of the licensing system in Ontario. Eliminating half the licence plates in the province equates to eliminating half the opportunities to identify people involved in crime; that was the essence of the reaction of some police officials. With such entertaining distractions in play, one can only imagine what gems await in the provincial budget, set for publication about the same time as this column. Decision Drivers of Canada SEE THINGS YOU DON’T SEE. UPCOMING DRIVING COURSES: Saturday Course: April 20, 27 May 4 & 11, 9am-2:30pm Four Day Course: Tues, July 2 - Fri, July 5, 9am-2:30pm Only Area Driving School that offers 11 Hrs of in-car instruction! Mapleton Fire & Rescue ask for your assistance to be the First Self Compliant Municipality! Check your smoke and carbon monoxide alarms. Go to mapleton.ca and fill out the form for #MapletonHeroes. We are on our way to success! Be a hero! Protect your loved ones! ed a look at the cost of liquor license inspections. The cost of township inspections for a liquor license applicant used to be $235, with $100 going to the fire department, $85 to the building department and $50 to the clerk’s department. The reduced fee, since passage of the bylaw, is $40. “We thought that the fee was maybe a little bit too high for the inspections,” said Baron. The liquor license changes highlight an effort to promote the township’s “open for business” approach. “We are just trying to make it easy for people and take away some roadblocks, essentially,” Baron added. We have everything you need to create that delicious Easter meal! messy and would like to tidy this up,” said Davidson. “The rates per hour in this grouping depending on the time of day range from $15 an hour to $24 an hour.” He asked council to consider replacing full-day, half-day and night meeting payment differences with a $20 per hour minimum compensation for extra meetings (with a three hour minimum), “regardless of what time of day it is.” The mayor also asked council to consider adjusting remuneration in accordance with annual inflation rates. Councillors agreed with the mayor’s recommendation to change the extra meeting compensation in the budget. Councillor Michael Martin suggested there also be a cap on the per diem allotment. “If you are away at a conference or something for multiple days, I am not sure how you would bill that, so if we could have a daily maximum,” said Martin. Councillors Marlene Ottens, Paul Douglas and Dennis Craven said they anticipate the remuneration increase will help attract more candidates in future municipal elections. Davidson then directed CAO Manny Baron to have a new bylaw drawn up in time for the next council meeting that incorporates the recommendations. ter, who will help us navigate the more difficult challenges in life. My suggestion? Look for a mentor or life coach who will be able to not just help your career but help you in life. Choose someone who can help you to understand faith issues better, someone who will help build your character. While it is good to have someone you can sit down with and talk to, don’t forget that you can also choose people from history. Reading some good biographies can guide us in life. And don’t forget - the Bible is a history book full of stories of people from whom we can learn, and it is the most life changing book of all. The HARRISTON Harriston Historical Society is hosting an evening with Jim author/historian Henderson on April 25. While researching war a Henderson, history, Palmerston native, conducted many tours to Vimy Ridge and other battlefield memorials. He will present stories about several of the names from the Palmerston and Harriston cenotaphs. Easter Flowers Many beautiful flowers to choose from including the traditional Easter Lily. Henderson has turned his passion for war history into a book entitled Before Their Endeavours Fade. The event will be held at 7:30pm in the Community Room at the Harriston library. Admission is free and everyone is welcome. There is currently a comprehensive war exhibit in the John Webb Room at the library, which will be available for viewing prior to the event on April 25. Grand District School Board about the location of a path to allow children to walk through the development to Minto Clifford Public School have been resolved. the noted Redmond school board was concerned about the proximity of the path to a stormwater management pond on the property. However, she explained, the path location has been moved. “Originally it was to cut through the stormwater management pond,” said Redmond. “So it will now continue down through lot 5 and 6. SCRAP CARS, TRUCKS, FARM MACHINERY, HEAVY EQUIPMENT. Scrap metal bins available. We sell quality used auto parts. Kenilworth Auto Recyclers 519-323-1113. Submit your classifieds for the Community News by calling toll free 1.844.843.5410, Fax 519.843.7607, or email: drayton@wellingtonadvertiser.com Deadline: Monday at 10am. TWO BUILDING LOTS for sale. Prime location in Mapleton Township northeast of Moorefield on paved road. Beautiful view, backing on to a river. 200’ x 428’ (1.94 acres) & 100’ x 428’ (0.98 acres). Call for more details, 226-448-2751. Welcoming Spring 2019 with lower prices on SIA Abrasifs sanding products. Discs, Portable belts, Sanding blocks and Sanding belts. Any size of orders welcome. Give us a call. It is a great route with great children. Weekends, PD days, and Pleaseoff. check make sure B-licence, a clean driver’s school holidays You to need a valid the information is abstract and that a vulnerable sector police check. correct. Mark any errors on Supply driving is also available. this to copy and email or Verburg, fax Send resume Principal Ray back to (519) 843-7607 principal@ccsdrayton.org or call (519) 638-3066 or call 519-638-2935 for more info or (519) 843-5410 Start immediately or in September. BY MONDAY 3PM. IF WE DO NOT HEAR FROM YOU, YOUR AD TOWNSHIP OF MAPLETON WILL BE PRINTED 7275 Sideroad 16, P.O. Box 160, IN THE NEWSPAPER Drayton, ON N0G 1P0 Phone: 519-638-3313, Fax: 519-638-5113, AS IT IS HERE. 63% of Canadians can't tell Toll Free: 1-800-385-7248 www.mapleton.ca the difference between real DEADLINES: and fake news. Now more than e v e r C a n a d a n e e d s t r u t h f u l 2 columns x 2” - $31.44 - LOCAL 20%journalism. + HST per issue The TownshipOur of Mapleton is seeking a highly motivated deadlines for Add your name to the list of supporters who want ad submission is Consultation individual with excellent organizational, financial and to keep reliable LOCAL news MONDAY AT 10:00 A.M. alive at www.newspapersmatter.ca. customer service skills to join our team as an PLEASE SEND BACK APPROVAL A.S.A.P. Our deadline for PROFESSIONAL TRUCK DRIVERS MORTGAGES error corrections is • 1ST, 2ND & 3RD MORTGAGES FULL-TIME PERMANENT FOR ANY PURPOSE MONDAY 3PM Haul bulk commodities throughout CONSOLIDATION Interaction with the public and other members of the team plays Thanks, • DEBT• BAD Ontario. Please feel free to call CREDIT an important role in this position. The successful candidate • TAX OR MORTGAGE ARREARS Class AZ driver’s license with recent us to discuss your ad. Alicia Roza • DECREASE PAYMENTS experience required. PROOF YOUR EXTEND YOUROF REACH - ADVERTISEAD PROVINCIALLY OR ACROSS THE COUNTRY! For more information visit www.ocna.org/network-advertising-program for every 2nd & 4th week DRIVERS WANTED SERVICES NOTICES until furtherFINANCIAL notice of the SCommunity News. a y N O t o FA K E N E W S ! Inventing.Davison.com/Ontario FREE Inventor's Guide!! REACH MILLIONS OF CUSTOMERS IN ONTARIO WITH ONE EASY CALL! Your Classified Ad or Display Ad would appear in weekly newspapers each week across Ontario in urban, suburban and rural areas. For more information Call Today 647-350-2558. GET UP TO $50,000 from the Government of Canada. Do you or someone you know Have any of these Conditions? A D H D , A n x i e t y, A r t h r i t i s , Asthma, Cancer, COPD, Depression, D i a b e t e s , D i f f i c u l t y Wa l k i n g , Fibromyalgia, Irritable Bowels, Overweight, Trouble Dressing...and Hundreds more. ALL Ages & Medical Conditions Qualify. CALL ONTARIO BENEFITS 1-(800)-211-3550 or Send a Text Message with Your Name and Mailing Address to (647)560-4274 for your FREE benefits package. We Can Help! Even in extreme situations of bad credit. Picture all of the fun, adventure and confidence building-moments – that’s what you’ll help create for girls, and for yourself, too. would like to express our thanks to friends and neighbours for their love and support to Henk during his illness and to us, his family, since his death. A special thank you to the nursing staff at Palmerston Hospital for their excellent care. Also thank you to Heritage Funeral Home for their attentive support and care. PERSONALS BEING SINGLE IS no fun ... MISTY RIVER INTRODUCTIONS can find you someone to BBQ with, go to the beach with or spend this summer and the rest of your life with. CALL (519)658-4204, www.mistyriverintros.com. Mr. Johnemail Morrison, Director of Finance Please us your Township of Mapleton APPROVAL or sign your below byAPPROVAL emailing: jmorrison@mapleton.ca Only those selected for an interview will be contacted. Personal information is collected under authority of the Municipal Act and will be used to determine eligibility for potential employment. The Township of Mapleton is an Equal Opportunity Employer. ENTRY: Drayton Food Bank Donation and/or Free Will Offering to the Community Christian School. 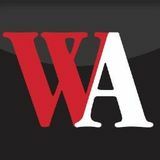 Drayton newspaper, Mapleton Township, Community News, Sister publication of the Wellington Advertiser.